House Republicans want to hold Democrats accountable for the party's near-unanimous opposition to caring for babies who survive abortion. The GOP is pushing a bill that would force doctors to provide life-saving care to babies who survive abortions. 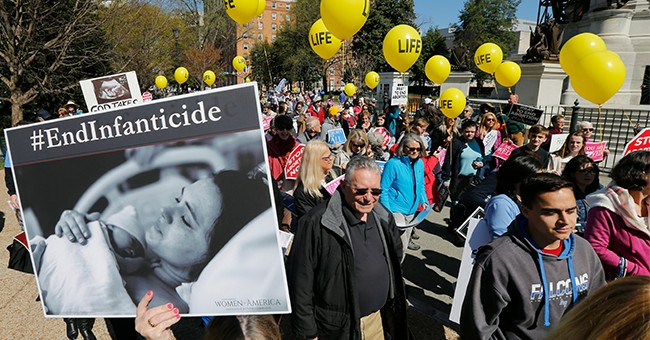 The Born-Alive Abortion Survivors Protection Act failed in the Senate after only three Democrats crossed the aisle to support it, falling short of the 60-vote threshold. The Democrat-controlled House has blocked a similar bill from even coming to a floor vote...The Born Alive Act has been informative for voters, according to Terry Schilling, executive director of the American Principles Project. Democrats' intransigence in the House, as well as active opposition from all of the party's declared 2020 nominees, could hurt it's appeal to voters, both moderates and a good portion of the party base. I left Planned Parenthood nine years ago after assisting in an ultrasound-guided abortion of a 13-week-old fetus. I saw the unborn child struggle for its life against the abortion instruments. I saw the empty uterus on the screen where life had been just moments before. This story is now a major motion picture released in theaters nationwide, called “Unplanned.” While the movie defied industry expectations at the box office, attention has also been drawn to an article written about my story soon after I left the abortion industry. I had never felt the need to respond to the false claims in this story until now...If Planned Parenthood actually had proof that this abortion I witnessed never took place, they would have brought it up when they took me to court. They would have already presented this evidence to the public and most certainly have taken further legal action. But they haven’t, because they know they can’t. They can’t because my story is the truth. Click through for her more detailed explanations. I'll leave you with the trailer for the film, as well as the following question: Since we're often told that "nobody is pro-abortion" (tragically untrue for some powerful extremists), why would anyone who espouses that position object to a movie made to persuade people that abortion is a bad thing?